It emerged in the Middle Ages and is considered the pinnacle of eastern professional music of oral tradition. 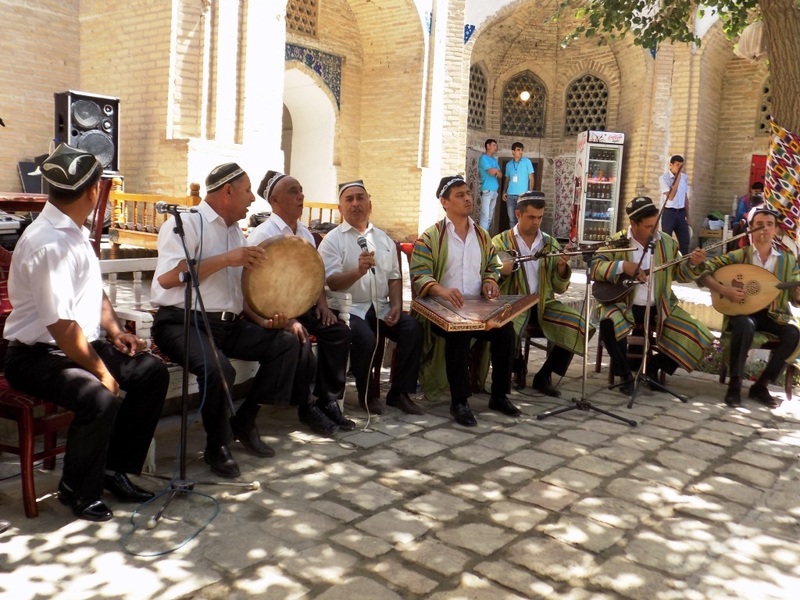 And your impressions of the trip to Uzbekistan, of meeting with its inhabitants will be incomplete, if you do not listen to Uzbek artists - performers of the singing genre. It will help you understand the "soul" of the Uzbek people, because this music has absorbed the rich sound palette and the whole philosophy of the East. Not every person can sing maqom - for that we need a strong vocal inherent nature and the constant work on oneself. Therefore, to this day, the old tunes of "maqom", filled with special meaning, are carefully preserved and passed down from generation to generation - from talented "masters" - an "apprentice." Therefore, this vocal genre is treated very carefully in Uzbekistan. Maqoms accompany man in all of the key events of his life: holidays, weddings and other ceremonial events. "Maqom" is a series of vocal and instrumental pieces in all its diversity. In Arabic, "maqom" means "location". According to some researchers, this music was born from the ancient tradition of canonized chants. At certain times of the day during the changing of the city guards the execution of special ritual music was ordered over the fortress and the city gates. It subsequently became known as "maqom". Each maqom is a kind of suite of 20-45 instrumental and vocal parts, which not only has a modal, but also the intonational, rhythmic and emotional feature. One can listen to maqom forever, because every overflow is unique, it is fascinating and soothing. As for the words, the poetic foundation of maqoms is built of samples of ancient folk poetry and lyrical works of Oriental literature classics - Hafiz, Bedil, Navoi, Jami, and many other poets. By its stylistic features maqoms conditionally divided into Bukhara and Khorezm cycles. Bukhara cycle "Shashmaqom" contains six maqoms - Buzruk, Rost, Navo, Dugoh, Segoh and Iroq. Each instrument section includes a few finished pieces - Tasnif, Tardzhi, Gardun, Mukhammas and Sakil that are different melodic and rhythmic constructions. Vocal sections of Bukhara maqoms consist of several compositions - shube, which are performed in strict sequence. The main musical instruments for performance of maqoms are traditional Uzbek national instruments - tanbur and doira. And to achieve the integrity and cycle dynamics maqoms usuli are executed - rhythmic inserts, knocked by doira or drum-nagara. Khorezm makoms, as well as Bukhara maqoms, consists of six parts, they contain several original tunes. Despite the fact that makoms are strictly canonized, various performers can change the tempo and allow for interpretation of usul and melodic intonations during execution. In 2003 Shashmaqom is recognized as one of the masterpieces of world heritage listed by UNESCO as an intangible culture.